Nafisa Ali's daughter, Pia Sodhi married her childhood friend Kshitij Khemka in an inimitable wedding extravaganza. 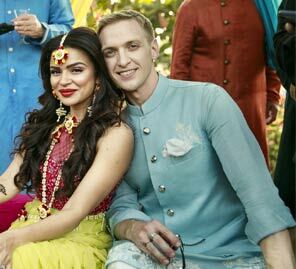 Actress Nafisa Ali’s daughter, Pia Zaranna Sodhi tied the knot with Kshitij Khemka in two different ceremonies and the decor done by WeddingSutra Favorites Devika Sakhuja spelled sheer elegance and class. Here, the bride gives us an insider’s view of how she met the love of her life and highlights from their elegant wedding ceremony. She says, “I met Kshitij in the sixth grade in school and we were really good friends for years. We were part of the same circle and even car pooled together. When you fall in love with your best friend, that’s a different level of comfort. A warm fuzzy feeling, like hugging your favorite unicorn. We come from different backgrounds and felt privileged to have had the opportunity to get married twice in three days. We wanted to immerse our family and friends in our own love, happiness and joy. 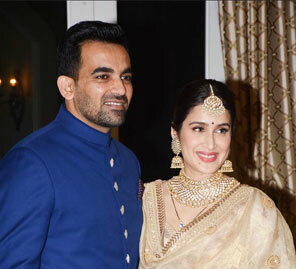 Pia dressed in a traditional red lehenga while her beau Kshitij complemented her in a white sherwani with a red pocket square. Pia’s pre-wedding functions were a simple affair at home with close family and friends. 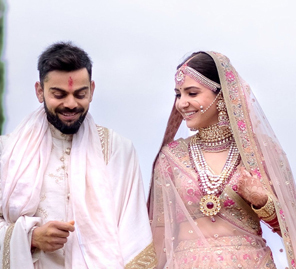 They also didn’t want too many events so they combined the mehndi and sangeet and hosted it at the bride’s brother-in-law’s family home, a beautiful Lutyens Delhi house. Pia says, “The décor was entirely done by Devika Sakhuja along with a few inputs from my mother. The theme was Maharaja– Colonial India. This meant a color palette of whites and blues of Rajasthan. Kshitij and I don’t like performances or bands at weddings so we kept it small and simple and everyone had a blast! 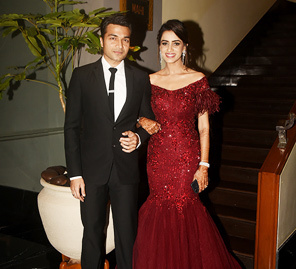 While I opted for a gorgeous creation by Tarun Tahiliani, Kshtij wore a Bandhgala by Shantanu & Nikhil.